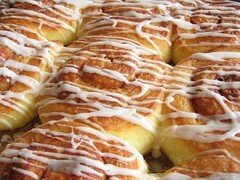 Brioche Cinnamon Buns - Do You Know The Muffin Man? Notes: I used the middle-class brioche dough as suggested in the book to make cinnamon buns. The dough was a breeze to make in a mixer, just be sure to mix it until it becomes smooth as it starts out quite shaggy. It wasn't clear how to proof or bake, so this is what I did: Made the brioche dough and let it ferment slowly in the fridge for 12 hours (while I was at work). Rolled out the chilled dough, shaped, and put it back in the fridge for six more hours (overnight). I should have brushed the dough with a bit of milk or butter before sprinkling on the cinnamon sugar as it spilled out during shaping. The final proof was done at room temperature for three more hours, after which I baked them in a 350°F oven for 25 minutes. Very soft and tender buns, could have used more cinnamon flavour.